I have a disposable Satellite L305D-S5869 or, more specifically, a PSLC8U-00Y010, for trips and low priority activities. It has the older Toshiba BIOS (Insyde H20 Rev 3.5 v. 1.8) with flakey DSDT code; it's hit or miss with ACPI or kernel module fan speed control. This appears to apply mostly to Slackware and Slackware hybrids; the laptop's fans do occasionally work with Fedora-based OS's. Another challenge for this crappy BIOS is hibernation, but that's another post. Not bad, except I had never heard the fan on even at over 70C. Taking a trip into the BIOS, there were no ACPI settings, but I added append="acpi=force"into LILO. Still over 70C with no fans. (On the BIOS tip, you can read further down that I also updated the BIOS to the latest version to no avail). We can set thresholds to whatever we'd like, using the program to increase or decrease fan use. I don't yet have a configuration file in place. A larger problems; it may be that fancontrol cannot detect my fans -- its configuration editor is unable to detect them. At first cut, it appears no Pulse Width Modification controllable fans are in the laptop, but it may be the system fan is controllable via some other method(s). 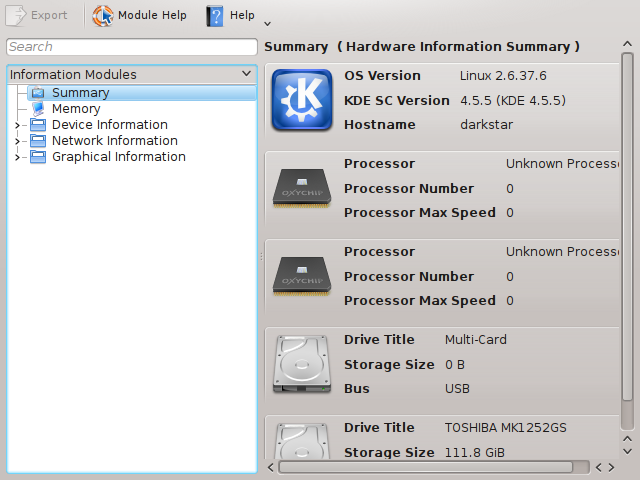 It's also of note that KDE is the WM running, and that Kinfocenter does not indicate hardware has been properly detected. Fedora-based distros have had no such problems. Accordingly, although this post began about cooling, detection is the first order of business, and it has been added to the title in parentheses. So instead of hal or other OS detection, let's directly access fan information. So this fan's ACPI identifier is PNP0C0B. The fan is currently off; what are its range of possible values when running? Now it's clear why no PWM functionality was detected by pwmconfig: the fan's options are apparently either "on" or "off". Power is controlled "auto"-matically. But similarly to these commands for a backlight, let's attempt to turn on "cooling_device0". This sort of problem continued with other attempts "invalid parameters" and so forth. The next step seemed to be query the device for legal settings. Assistance via a specialized program to add to efficiency seemed sensible. Forcing the fan of/off is only supported on Toshiba laptops. No Toshiba ACPI extensions were found. Hah! OK, so "No Toshiba ACPI extensions" on a Toshiba laptop means that either specific kernel modules are not loading for Toshiba, or playing with the BIOS and LILO until this changes. Probably the former, toshiba_acpi.ko. Hopefully this is not too many modules and hogs memory. Following this I rebooted. As feared, the kernel was unable to detect the Toshiba-ness of the laptop, even after building in the Toshiba-specific features above, in addition to some other switches which I hoped would allow the kernel to grasp it was in a Toshiba. Next stop is the BIOS. The BIOS, Insyde H20 v.1.2 rev.3.5, appears rudimentary and has no ACPI settings. Perhaps we can flash it to something better/more recent. At the Toshiba website, the most recent (April 2009) BIOS for the L305D. Sort of old and the file is Windows specific - slc8v180.exe. I ran strings against it see if it was just an archive. Let's see if we can find better interaction with a different OS, with a newer kernel. Installed Arch and then compiled acpitool. You must have write access to /proc/acpi/toshiba/fan to stop or start the fan. 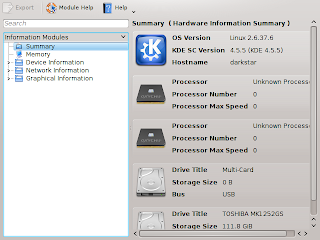 Or ensure yourself you are running a kernel with Toshiba ACPI support enabled. Fails, but more information. Acpitool apparently only points at /proc/acpi/toshiba/fan, but the fan directory for this this system is /sys/bus/acpi/drivers/fan. Let's attempt a softlink, first being sure there is a /proc/acpi/toshiba directory into which we can link a "fans" directory. Let me get this straight, ln fails to create a directory, because the directory it's supposed to create doesn't exist before it creates it? Brilliant program. But at any rate, the device in the "fan" directory, PNP0C0B:00, is a symlink to another directory. drwxr-xr-x 4 0 0 0 Aug 1 12:06 .
drwxr-xr-x 6 0 0 0 Aug 1 12:06 ..
Now in each of these three sub-directories "driver", "power", and "power_resources_D0"
drwxr-xr-x 2 0 0 0 Aug 1 12:07 .
drwxr-xr-x 14 0 0 0 Aug 1 12:06 ..
drwxr-xr-x 2 0 0 0 Aug 1 18:41 .
drwxr-xr-x 4 0 0 0 Aug 1 12:06 .. The two symlinks are problematic infinite loops, but "power" appears to contain a useful writeable file named "control". According to this site, which is about USB, but has the appropriate power information, we should be able to use /power/control to change the fan's state from "auto" to "on". In other words, although the device seems to accept the power change, the fan does not power-up. And though we can see it in sys/devices, it's not detected by the kernel. Yeah, we see it in dmesg during boot, but it never is seen by the kernel -- we can tell because it never forms an entry in /proc/acpi. During boot, it's called "FAN1", but after that...gone. These are the same settings (and same problems) as earlier above in the former configuration: /sys/devices/LNXSYSTM:00/device:44/PNP0C0B:00/. A Gordian knot with no apparent commands to reach inside it -- so close but so far.